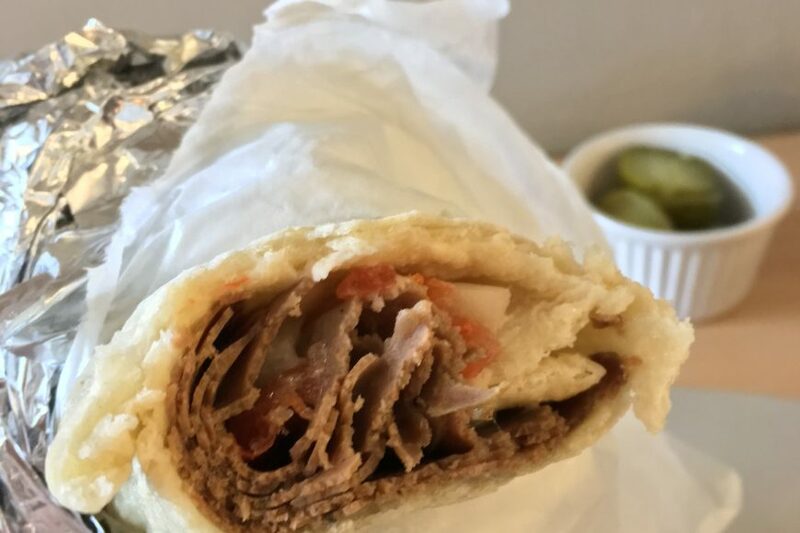 My Ottawa Donair Quest – a gastronomic hunt for the best Halifax-style donair in Ottawa – hasn’t been the easiest. Other than one shining star of donairness, it’s been a slog through disappointing donairs filled with blasphemous lettuce, and grey, pre-cut, from-frozen donair meat. 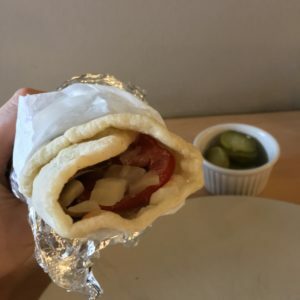 When I heard that Hintonburg-based bakery and cafe Bread By Us was selling their own house-made donairs on Wednesdays, I made my way there with hesitant optimism. The promised land or another disappointment? On my first attempt, I just missed out. I had arrived around 12:30, and the person in front of me bought the last four donairs. Slightly crushed, I consoled myself by getting a loaf of delicious sourdough bread to take home. With the knowledge of the limited supply/popular demand for the donairs, attempt number two was made an hour earlier. When my friend and I arrived, there were a few other people sitting at the small wooden bar that lines one side of the room, and with us added to it, they were nearly at capacity. With all the wood, and the hip bakery vibe, this is likely one of the nicest places where I’ve had a donair. 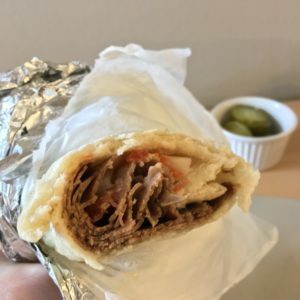 The donairs are $10 flat, and come with the traditional fillings – donair meat (house-made with grass-fed beef at that), onion, tomato, and donair sauce – all on a pita. No lettuce in sight! They come with small sides, so I went with some pickles as a foil for the anticipated richness and sweetness of the donair. I’m not 100% sure, but from my two visits it looks like the donairs are pre-made, wrapped in foil, and once an order is up, they’re put in a sandwich press to heat through. I assumed that they must go lighter on the donair sauce than most places back in Halifax, as they would quickly become a soggy mess (more so than usual, that is). After a short wait, we had our donairs in hand. While a $10 donair in Halifax would make you at first really happy, but then absurdly full and questioning your life choices, Bread By Us’ was long and narrow. That being said, their ingredients are of a higher calibre, the storefront is much less dingy than your typical Halifax donair joint, and they admirably pay their workers above minimum wage. I can dig a donair with a social conscience. Good ethics are all well and good, but how was the product itself? A breath of fresh air. Well, not literally, because of the spice of the meat and the donair sauce, but it was head and shoulders above nearly all of the donairs that I’ve had in Ottawa. The donair meat was thinly cut and neatly layered, in almost comedic contrast to the hot mess of a donair you would find back in Halifax. While it didn’t have any crispy edges from finishing on a flattop, the flavour profile was spot on, and had a mild kick to it. Although the donair sauce wasn’t put on with a particularly heavy hand, there was still plenty, and the sweet and tangy punch was familiar and pleasant. The onions and tomato provided their additional depth of texture and flavour, and mild illusion of healthy vegetables. The pita had a bit more heft to it than the Lebanese ones used in Halifax, although it wasn’t as bready as a Greek pita, and held together well. A little more browning from the grill would be nice, but wasn’t a deal breaker. Small bakeries not being the best for lingering, it was with happy bellies that we hit the road. 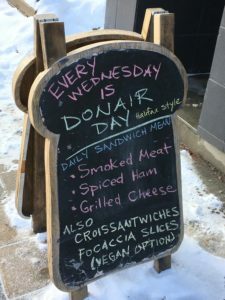 Bread By Us’ donair is easily in the top two in Ottawa; with the care, attention to detail, and quality of their product, it’s a shame that it’s only available one day a week.